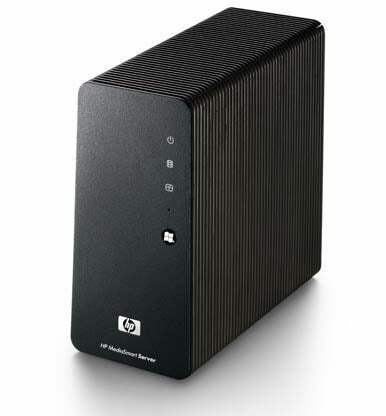 There was a buzz earlier this year about HP’s MediaSmart Server LX195, a network-attached storage (NAS) device you can use to store music, videos, and more on your home network. Its intuitive interface, well-thought-out instructions and setup process, and user-friendly controls make it an enticing model for consumers in mixed computer settings. But first, the bad news. The LX195 requires Windows to set up; we were successful using a Mac running Windows via Boot Camp, as well as Windows on a Mac running virtualization software. This inability to work with the Mac for setup will be a deal breaker for some Mac-only users. And you’ll need to use Windows anytime you want to alter the settings for many of the LX195’s main features including Time Machine, remote access, iTunes sharing, and streaming through a DLNA player. Once the LX195 is set up, however, Macs can access the files on the LX195 easily. The HP software is either the most useable or the least useable on the market, depending on your perspective. It’s the least practical option for dedicated Mac users because the Windows Home Server Console that the LX195 uses for administration can only be accessed through Windows. However, the software controls are varied, intuitive, and beautifully laid out. Colorful tabs greet you on the left; when you first open the console, you see tabs where you can set up the key features: Remote Access, Features For Mac, Server For iTunes, Server Online Backup, and HP’s Photo Publisher all get individual tabs. A help menu is ever present and easy to read. Intuitively designed icons tell you how the device has been configured, what updates are available, and more. If you’re looking for a place to centrally store your media files and share them with everyone on your network, the LX195 is an intriguing option. Of course, the LX195 required lots of administrator authentication to allow the user to share media. But afterwards it’s a snap to share folders or stream media to a DLNA player such as a Playstation 3. The LX195 even includes a server for iTunes for streaming over the network. The LX195 offers remote access services, allowing you to access your data from any location that has Internet. This is great for traveling users who don’t want to lug around an external hard drive but want to show videos or photos to relatives they’re visiting. The multistep process can be daunting, but HP does a good job of walking you through it. For those that want to use the LX195 as a centralized backup unit for a group of computers, the server also works with Time Machine. If you’re not content with the 640GB capacity, the LX195 has four USB ports to further expand the storage capacity (though the drives need to be formatted using FAT32). The LX195 makes setting up the various features of the unit easy. A red/yellow/green system indicates which elements of the unit haven’t been calibrated yet and guides you through the setup process slowly and with great ease. Unfortunately, as robust as the features are, there are some absent elements that would round out the unit nicely. The LX195 currently doesn’t offer any BitTorrent download support; many other home media servers come equipped with BitTorrent protocols that enable the units to help shoulder the download burden and thereby make the process faster and more efficient. HP’s MediaSmart Server LX195 is a very cleverly designed machine that is definitely the most beautiful and smartly designed home media server we’ve seen, but you need Windows to get it up and running and for continued maintenance. Though not ideal for Mac-only homes, Users in mixed environments (both PCs and Macs) should seriously consider the LX195.